Style meets speed in the new Capresso H2O Steel Electric Water Kettle. Faster, safer and more energy efficient than any stovetop kettle, this contemporary 57-ounce capacity cordless water kettle is the first model in the Capresso line to combine beautiful stainless steel housing with streamlined, one-switch operation. 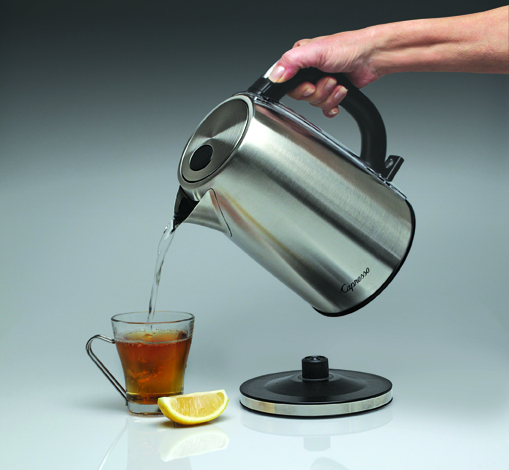 The Capresso H2O Steel offers an easy way to boil water for tea, hot chocolate, French press coffee and more. With a simple push of a button, the power switch is illuminated and the unit begins to heat the water. Upon reaching a boil, it automatically shuts off. A Micro Filter spout traps particles so they do not disrupt the purity of the beverage. This kettle is designed for a fast, yet quiet boil. The low-noise, stainless steel-heating element is concealed in the base of the kettle. Water gently comes to a boil setting the stage for the serene act of preparing a hot beverage. The Capresso H2O Steel has a suggested retail price of $49.99 at http://www.capresso.com. Capresso offers a growing selection of electric water kettles ranging from $49.99 to $99.99. For more information, visit http://www.capresso.com.